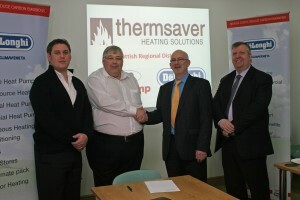 In February 2010 the Thermsaver Renewables Training and Visitor Centre was opened in central Scotland by MSP Michael McMahon, offering one day introduction and two day full technical courses on our range of products and services. The centre has been widely used by clients looking at multiple options for heating, hot water and ventilation. Partners from across Scotland have also benefited from technical product training, design and installation procedures. Within the unit we have many fully operational products installed, including a Biomass boiler and hopper which has enabled us to dispense with the gas boiler. There is a combination of Underfloor heating systems and radiators together with a wall heating system. A buffer tank and unvented hot water cylinder with solar coil is also installed with an Air Source Heat Pump. As well as this, Heatmiser controls provide all the time and temperature requirements within the centre and an MVHR system ensures clean fresh air throughout ,while extracting moisture and odours from the kitchen and bathrooms. Thermsaver are always looking to link with quality engineers and prospective partners across Scotland and the Highlands and Islands. We provide full training on all our products and operate a strict quality control programme. Clients with projects and drawings are also welcome to view and discuss the options available to them. As a family-led company who have been in the business for thirty years Thermsaver have no standard packages or systems, only those tailored to our client’s specific requirements. There’s also no pressurised sales techniques as we always aim to offer our clients the best possible service and value by taking into consideration any and all government funding which may be available to them. If you’re still not convinced just take a look at our Case Studies section for more information on our previous work. Thermsaver are a company who practice what we preach, we wholeheartedly believe in renewable energy and if you do too, you should give us a call on 01698 300100 and arrange an appointment to visit us at our excellent training facilities.